O Gold was among the first metals to be mined because it commonly occurs in its native form, that is, not combined with other elements, because it is beautiful and imperishable, and because exquisite objects can be made from it. Artisans of ancient civilizations used gold lavishly in decorating tombs and temples, and gold objects made more than 5,000 years ago have been found in Egypt. O The gold in the Aztec and Inca treasuries of Mexico and Peru believed to have come from Colombia, although some undoubtedly was obtained from other sources. The Conquistadores plundered the treasuries of these civilizations during their explorations of the New World, and many gold and silver objects were melted and cast into coins and bars, destroying the priceless artifacts of the Indian culture. O The degree of purity of native gold, bullion (bars or ingots of unrefined gold), and refined gold is stated in terms of gold content. "Fineness" defines gold content in parts per thousand. For example, a gold nugget containing 885 parts of pure gold and 115 parts of other metals, such as silver and copper, would be considered 885-fine. 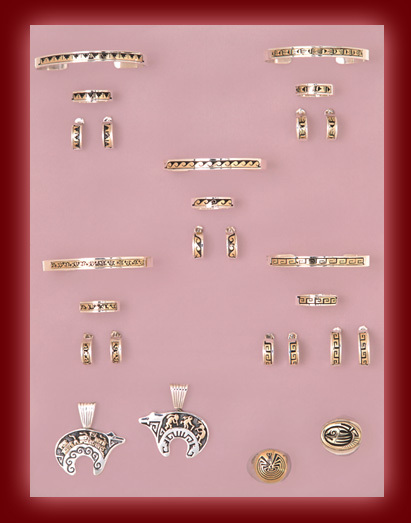 "Karat" indicates the proportion of solid gold in an alloy based on a total of 24 parts. Thus, 14-karat (14K) gold indicates a composition of 14 parts of gold and 10 parts of other metals. Incidentally, 14K gold is commonly used in jewelry manufacture. "Karat" should not be confused with "carat," a unit of weight used for precious stones. Click on the piece of Jewelry of interest for detailed view and price.